The Hubble Space Telescope (HST) has captivated the world’s imagination since its launch in 1990. The images taken by HST over the years have opened up a level of unparalleled clarity into the cosmos. When it looked like the aging old dame of space telescopes was nearing the end of its life, I was relieved to learn there would be one final repair mission (HST-SM4, the fourth servicing mission) which would allow the telescope to function until at least 2014 when its successor, the James Webb Space Telescope is scheduled to launch and take over the task of probing the universe. The servicing mission was a great success but the science world held its collective breath as HST was put through its early paces. With a collection of new instruments and upgrades, HST recently began to show off its new talents. If the initial batch of images is any indication, we’re in store for some amazing science in the years to come. HST already has demonstrated its rejuvenated powers with a stunning collection of new images. On top of the list are images of exploding stars, a stellar nursery, colliding galaxies and the lensing effect of a galactic cluster nearly half way across the universe. HST’s calibration just after the servicing mission was interrupted briefly on July 19th, for an unusual opportunity, to observe Jupiter in the aftermath of a collision with a suspected comet. HST's suite of new instruments now allows it to study the universe across a broad array of the electromagnetic spectrum, from ultraviolet light all the way to near-infrared light. For HST, a new phase of full science operation commences. Demand for observing time will be intense. Astronomers look forward to using HST for a broad range of observations especially exoplanet research. There are also plans to obtain the deepest ever far-infrared portrait of Universe to expose new young galaxies that existed when the Universe was less than 500 million years old. This Physics Groupie looks forward to the next Hubble decade as the stage is set for unparalleled discoveries from the distant corners of the universe. 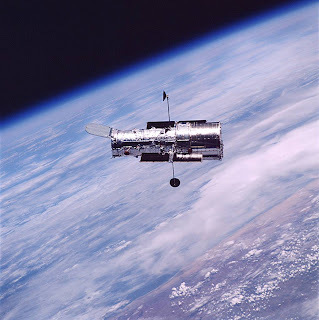 Thanks to the rebirth of Hubble, another generation of school children can grow up with a unique view of the cosmos never before witnessed.